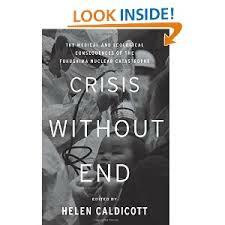 Dr Helen Caldicott’s new book, Crisis Without End: the Medical and Ecological Consequences of Fukushima, is a compilation of the symposium she organized at the New York Academy of Medicine in March 2013. * The latter was a virtual Who’s Who of nuclear physicists and radiation health experts. In the short video below, she gives a brief overview of the nuclear accident at Fukushima and the systematic cover-up by the US and Japanese government of the on-going threat it poses to all global inhabitants. What Actually Happened at Fukushima? Following a March 2011 earthquake and tsunami that knocked out their cooling systems, three nuclear reactors experienced core meltdowns. When a meltdown occurs, the core overheats to the point that it melts through the containment vessel into the grounds. Driven by the intense heat of continuous chain reactions, the molten mass continues to spew radiation into the environment over an extended period. The mountain streams that flow under the stricken reactors absorb this radiation from the molten cores and carry it to the Pacific Ocean. Approximately four tons daily of radiation-contaminated water has been flowing into the Pacific Ocean for 3 ½ years. One the radiation reaches the ocean, it’s taken up into the food chain where it’s “biomagnified” (i.e. small fish eat radioactive algae, which are eaten by larger fish). Tuna is at the top of the food chain. Which is why tuna caught off the coast of California contains radioactive cesium that originated at Fukushima. The Japanese government knew almost immediately the meltdowns had occurred – expose the whole of Japan and the American West Coast to massive doses of airborne radioactive fallout – and covered it up for three months. They and Tepco, the private company running Fukushima, continue to mislead the public by asserting it will take forty years to stop the flow of radioactive water into the Pacific. According to Caldicott, no technology exists at present to reverse the effects of a nuclear meltdown. A new law Japan passed in December 2013 makes it illegal for journalists to disclose any information about Fukushima that the government wishes to suppress. Obama, the pro-nuclear president (he received a $250,000 campaign contribution from Exelon Corporation) colluded in the cover-up. Instead of warning Americans in Seattle, Florida and other US sites that they were being exposed to high levels of airborne radioactive fallout (specifically I 131), he specifically denied that the US faced any risk of radiation exposure. Caldicott maintains the EPA has an absolute legal and moral obligation to monitor radiation levels of US air, water and sea food, especially as the Fukushima site remains extremely vulnerable to a future earthquake, tsunami or typhoon. Workers are still pumping seawater on the stricken reactors to cool them. Afterwards the radioactive seawater is stored in 1500 enormous storage tanks held together with adhesive tape. Obama, in contrast, is far more concerned about protecting his friends in the nuclear industry. Amazingly he has just finalized $6.5 billion $6.5 billion in loan guarantees to build two new nuclear power plants in Georgia. Hillary Clinton is also a major player in the cover-up, with the agreement she signed immediately after the Fukushima accident, for the US to continue to import Japanese seafood. Caldicott warns that under no circumstances should people anywhere eat rice, fish or miso imported Japan – owing to high levels of radiation it contains. Caldicot also discusses the 1986 nuclear meltdown at Chernobyl (Ukraine) which has caused one million, mainly cancer-related, deaths across Europe. Information about the effects of Chernobyl in other parts of Europe is also being suppressed. Lambs in Wales, Wild boards in Germany and Turkish hazelnut are still too dangerous to eat due to radiation contamination. We here on Long Island have learned to love our radioactive waste Brookhaven Lab, you know the people who don’t have a particle accelerator or two underneath us, wouldn’t have it any other way. You get used to cancer, the medical profession loves it and it creates a lot of jobs. I think it’s mostly hoax with a small nuclear warning to Japan thrown into the bargain. My husband thinkis it is absolutely for real although probs caused by a nuke. So there you go. I also think it is a convenient blame all for the chem trail stuff. Yeah, I cannot get Rense to put me on no matter who asks. That tells me something….the US is bound magically plus these top radio guys, like others, get …ahem….compromised maybe? Rense is besties with Icke, btw. Rense sent me a PM, practically admitting he was a Free Mason when i sent what I published in Behind the Bush 6 to him before I ever even heard of VT. His only objective is to stir up dissent, fear and mindless hate. That’s when I just decided to hone my writing skills on Open Salon then worry about getting published, worked out well didn’t it. By the way you are welcome to anything I have on the OS Blog just put my name on it. Just Google jackheart.